The most common cause of severe fetal anemia is blood type incompatibility in pregnancy. In typical cases this is to do with Rh blood group, where the mother is Rh(D) negative, and the fetus is Rh(D) positive, and the mother’s body produces D antibodies, causing hemolytic anemia in the fetus. Human parvovirus B19 infection (“slapped cheek disease”), among other conditions, can also cause fetal anemia. Fetal anemia is diagnosed by fetal blood sampling and Doppler evaluation of fetal middle cerebral artery peak systolic velocity. (1) Ultrasound is non-invasive and can be implemented repeatedly, but can only provide insight into indirect symptoms. Fetal blood sampling from the umbilical vein under the guidance of ultrasound allows for a confirmed diagnosis. When fetal anemia is diagnosed, red blood cells are transfused for fetus. 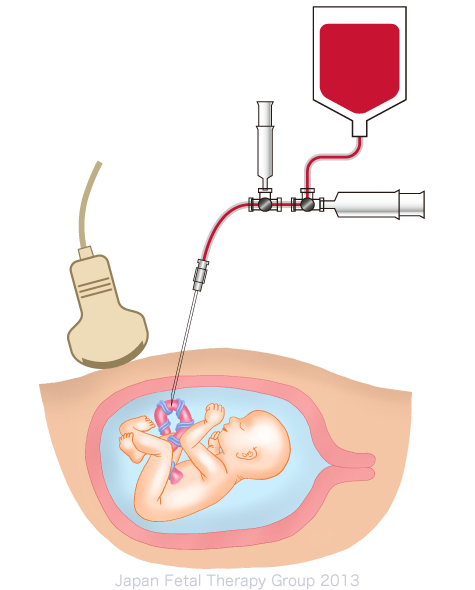 One of the most successful fetal therapies in existence, the current method of transfusion via the umbilical vein under the guide of ultrasound has been used since the 1980s. Other therapies involve waiting for the maturation of the fetus, or delivering the baby early and providing it intensive treatment, including transfusion. Since in general, fetal anemia is progressive, the condition of patients tends to worsen while under observation, and early delivery can also bring problems caused by prematurity. Local anesthetic is applied to the point at which the abdominal wall of the mother is to be punctured, and the umbilical vein is punctured under ultrasound guidance. Depending on the situation, transfusion may also be implemented into the abdomen of the fetus. Type O Rh-negative blood, which has been confirmed as carrying no infection, is transfused in the calculated quantity (Fig. 1). ‘A few cases are accompanied by complications such as fetal bradycardia, blood loss from the puncture, fetal heart failure, infection, early membrane rupture or premature delivery, etc. Fetal transfusion can only be carried out at a facility capable of conducting the procedure, since it requires technical expertise. Prognosis depends on the cause of the fetal anemia, but a report of 254 cases of fetal anemia(5) , to which fetal transfusion was administered a total of 740 times, provided excellent treatment results, with a survival rate of 89%.